I was in the office a few weekends ago, catching up on correspondence and cleaning up from the cyclone that must have whipped across my desk during the week. 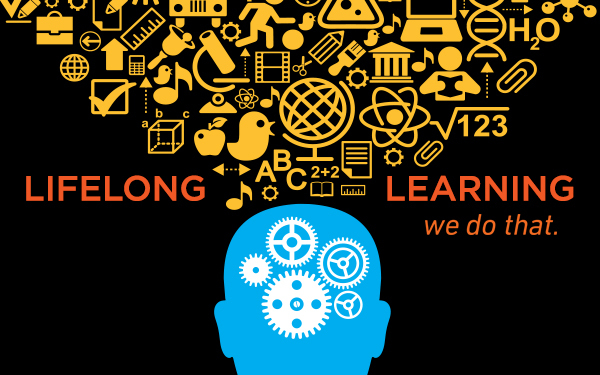 Always up for learning something new, I was poking around the Internet and landed on a learning site, General Assembly. GA offered me Dash, which promised I would “LEARN TO MAKE AWESOME WEBSITES.” What could be better on a Saturday morning than that? Not quite, Jerrod, but nice try. For a traditional writer like me, writing with brackets and tags instead of commas and adjectives was like riding a bicycle backwards. Wearing flippers. But here are a few screen grabs of my handiwork that morning. 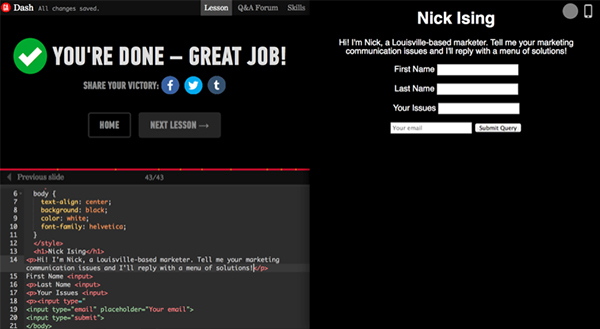 First, I created a headline and inputs. Ok, so I’m not going to be replacing Jerrod, Rex or any of our Wyzard…ever. But this exercise gave me some background and appreciation for what they do eight hours every day. The exciting part of this story is all the outside-our-comfort-zone learning other bulbs at C360 are taking on. 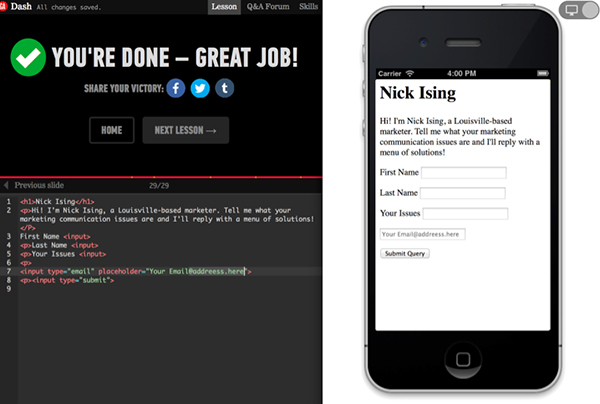 One Client Service staffer is nearing completion of his first Code Louisville course. And another Account Coordinator and Designer are preparing to start their 12-week immersion into code, as well. Rick Schardein, our founder and chairman, recently built and launched a website as a gift to his son-in-law who recently took over a Tennessee orthodontics practice. Though it’s not cutting-edge web development, it certainly gets the job done. And done well. Account folks are learning code and adapting content management systems. Designers are expanding proficiencies in motion graphics, digital photography and food styling. And copywriters are creating smart recipes for healthy dish options.